Pumpkin Cream Cheese Cookies – soft and chewy pumpkin flavored cookies with a cream cheese filling and a cake-like texture. It is no wonder that I was craving for a pumpkin dessert this past weekend. Those beautiful golden orbs are on display everywhere. As I was busy with other things, I had to settle for something store bought. The limited edition pumpkin cheesecake cookies from a very popular manufacturer would have to do until I can find time to make my own. The white chunks in the cookies tasted more like white chocolate than cheesecake. Even so, they were pretty good- soft and chewy but a tad too sweet for me. I really like the idea of combining pumpkin and cream cheese in a cookie. Since cream cheese is soft, it can either be mixed into the dough or used as a frosting. Of late though, I have been seeing a lot of filled cookies in cyberspace which I had in mind to try. Now is as good a time as any. The cream cheese would be perfect as a filling. Soft and chewy pumpkin flavored cookies with a cream cheese filling and a cake-like texture. Combine cream cheese and powdered sugar in a bowl. Beat with electric mixer until smooth, about 1 to 2 minutes. Cover and transfer to the refrigerator. Allow it to chill at least 30 minutes. In a medium sized bowl, combine flour, baking powder, baking soda, salt, cinnamon, nutmeg, and cloves. In a large large bowl, beat butter and brown sugar until light and fluffy, about 2 minutes. Add egg and vanilla and beat until well blended. Slowly beat in pumpkin puree. Then add dry ingredients, beating in as much as the beater can handle. Mix the rest in with a spatula until just combined. Lightly flour your hands. Scoop a rounded tablespoon of dough the size of a large walnut into your palm. Flatten and add about ¾ teaspoon cream cheese filling in the center. Wrap dough around filling. Roll into a ball to seal. Flatten the ball before placing on a cookie sheet. Repeat until all dough is used up. Bake cookies at 350°F (180°C) for 23 to 25 minutes. Remove and allow cookies to cool on baking sheet for 10 minutes. Transfer to a wire rack and allow them to cool completely. 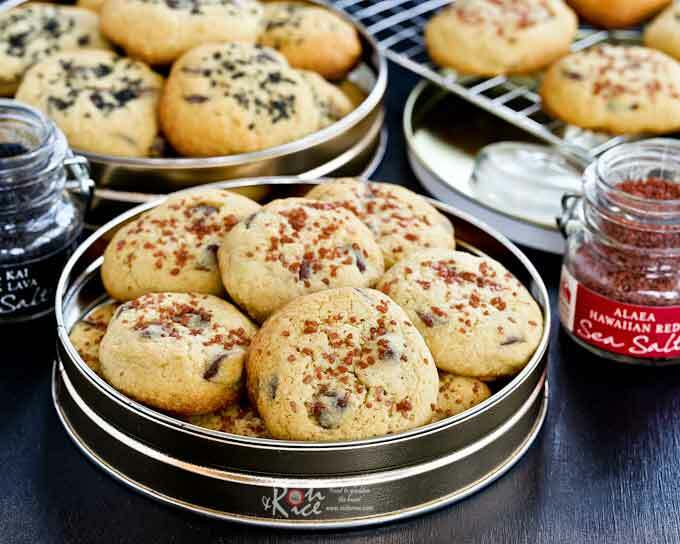 Store cookies in air tight container and refrigerate if not eaten within a day. These Pumpkin Cream Cheese Cookies are soft with a cake-like texture. Two should be sufficient to satisfy any pumpkin craving. 😉 The rest should be refrigerated if not eaten within a day. The cookies look so appetising! Are the pictured cookies the store bought ones or the ones made using the recipe above? I have been meaning to try making stuffed cookies too as they seem to be all the rage now in the food blogosphere. Lovely teacup, by the way. Is it by Royal Albert? The teacup and saucer is a mix and match and one of my favorites. The teacup is very pretty, Tuscan, England while saucer is Royal Malvern, England. Bought this at a flea market. Would love to have the Tuscan saucer but I must say they did a very good job matching the two pieces. I see! LOL I MUST try these – I know my boys and I will love them as we are cheesecake fiends!! Can these be frozen? they look delicious! I would not freeze these because of the cream cheese as the texture may change once it is thawed. I love the inside of these cookies with the cream cheese filling. Oh I bet these are SO delicious! Putting them on my cookies to make list! These cookies have a cake-like in texture and the cream cheese filling complements it nicely.